I used to have an overflowing wardrobe but when I wanted to get dressed each day I couldn't find anything I liked or that looked good together. That all changed when I started to apply the principle of capsule wardrobes. When I added new pieces to my wardrobe I would make sure that it complemented my wardrobe. For each season I would add a maximum of15 pieces that would all mix and match perfectly. A combination of in-style pieces with basics that would give me up to 100 outfits to wear if . I would make sure it would mix with my existing wardrobe as well which would give me LOTS of outfits for the season. That's exactly what we do now in the 40+Style club. 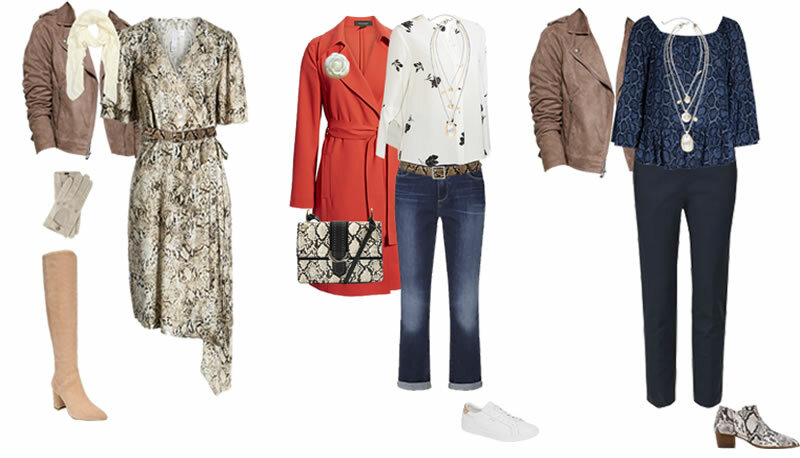 At the start of each season, we create a brand new capsule wardrobe. The spring 2019 spring capsule and challenge is now here! 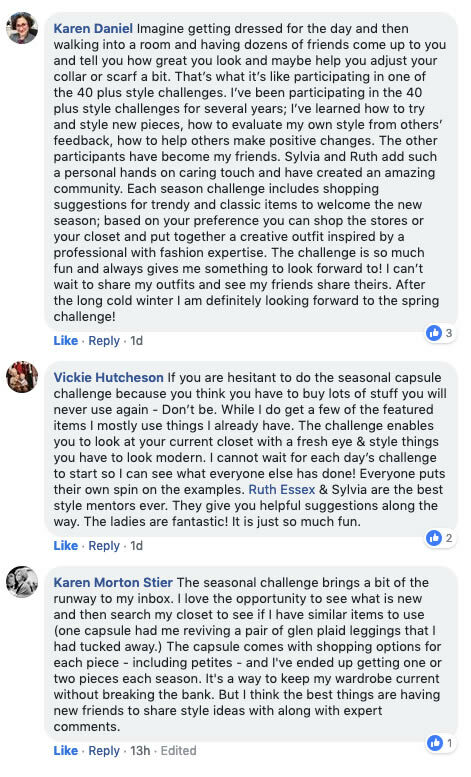 Much more than just a capsule, the capsule challenge is about creating your unique wardrobe for spring. You can also participate in the capsule challenge, where you will get lots of new ideas for a similar outfit. You will get feedback from our professional stylist on any looks you post and take your style to a new level. Get connected to an amazing group of women over 40 who all share a love of style and have become expert stylists! 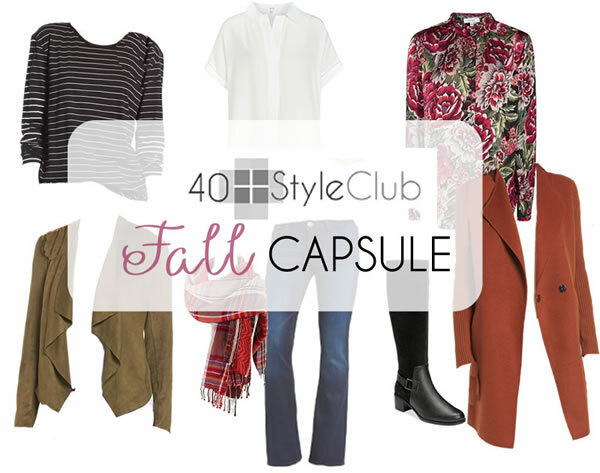 The 40+Style Club offers you much more than just the capsules. 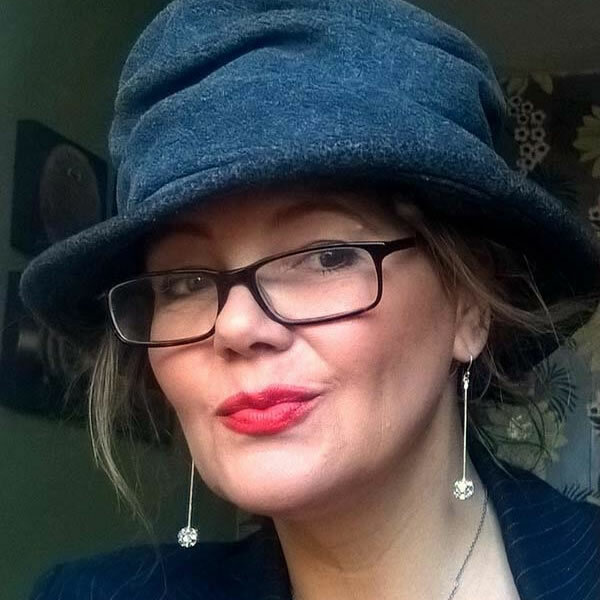 Meet Ruth live each month in our private group where you can ask her any questions you want or take advantage of her knowledge around the current style theme. Don't just take it from us, let our customers tell you why they learn so much from our challenges! "Style is joyful if you allow yourself to have joy"
What kind of clothes will be featured in the capsule? We feature a variety of styles, but in general we focus on casual chic outfits which are suitable for most work and casual situations. Is this like Stitch Fix? Do I get any clothes? No. We are just offering you ideas and training. You'll get a shopping list and a guide. We also give you lots of feedback and all these combined will help you to become a better dresser. Our aim is to make you feel and look amazing and we give you the tools and training to do so! We give you a shopping list during capsule challenges but these are just suggestions. You will find that you have most of the pieces we suggest already in your wardrobe. We are here to help you save money by creating a cohesive wardrobe and showing you many ways in which you can mix and match your clothes. Will I get access to the 21 steps to a More Stylish You course and the Accessories course too? No these courses are sold separately as they are 2 month long intensive programmes. For what seasons are the capsules created? The capsules are created with the northern hemisphere in mind, which means winter in December and summer in July. However, you could easily create summer or winter versions from the outfits. Of course the general style advice is applicable to all women all over the world. You will get a welcome email with your access info to the site. You will get immediate access to the challenge and ALL other style training and videos in the style club. If you can’t find the email, please check your Junk, spam or promotion folder in your email programme. If you still can't find, send a note for support at support@40plusstyle.com. The stylists in the style club will give you expert style advice for a whole year for much less, which is so much more effective as evolving your style takes time. Not to mention the amount of money you will save from not buying the wrong clothes. Are you ready to feel confident and happy with your style? and become a more confident and intuitive dresser? 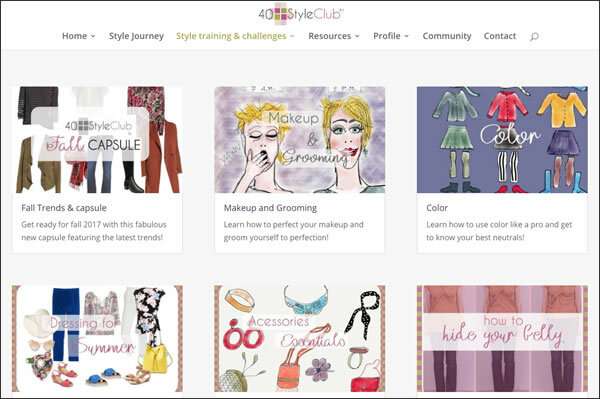 Enrol in the 40+Style Club today and get instant access to the capsule and all training!